Hello everyone, today I am going to share with you some of the causes and the effects of thread nests caused by looping threads.And as usual, these problems and remedies are the same theoretically regardless if your machine is new,or like ours, OLD. We like vintage sewing machines simply because we have found them to be very well built,easy to maintain,and very reliable. Regardless if your machine is a rotary shuttle, oscillating shuttle, or simply a turn of the century vibrating shuttle the theory and physics of the lock stitch sewing machine is still the same and therefore the causes and cures are directly related across the sewing spectrum. Personally, I think its super cool to watch a digital electronic machine go whizzing into all of its different functions with just a push of a button. Sadly though it only took one time of pushing the button,only to have the electronic controls foul up causing the machine to try to do combinations of things not meant to happen at the same time.What a mess, chipped gears timing all messed up feed-dogs moving randomly and a control board that was outdated and not available any longer on a machine that was only 7 yrs old. It was a bittersweet experience for me, I still like to watch the electronic wizards on the showroom floors but I don't believe one will ever take the place of any of our vintage machines. Now back to our original subject matter.thread nests and loopy seams. First off we are going to assume the machine is freshly cleaned and polished and purring like a kitten. We have just filled the bobbin and threaded the machine with the spool we used for the bobbin. This way we know the top and bottom thread match. Not only in diameter but also in tensile strength and construction. As we make our first attempt at the perfect seam we notice the machine starts to sound different after about 8-10 stitches.Another 3-4 stitches and now it struggles then binds up and stalls. The top stitches look good but when we try to remove our fabric it won't lift up or move forward. Here in The Quilting Room, my favorite utensil in this circumstance is a razor blade or exact-o-knife, Once we have it all cut loose we can see the tangled thread nest was the result of large loops of thread on the bottom side of the seam. This almost always means the top thread tension is too loose. The first thing I do in this situation is to look to make sure I threaded the machine properly and that the thread is actually between the tension disks, keep in mind the presser foot needs to be up when we thread through the disks if the machine has an auto tension release or the thread may ride over and around like a pulley . If it does not have the auto release then flossing the thread between the disks will help to ensure proper placement between the disks. Now that we know it is threaded right and positioned properly, before threading the needle I will pull the thread through with the presser foot up. There should be no noticeable drag from the disks until the auto-release is disengaged by lowering the presser foot. Pull on the thread again and check for drag. If there is still no tension then I tighten the tension dial until I can feel a slight drag. If you do not feel the drag and you have tightened logically tight, then there is something interfering with the tension assembly, IE dirty or assembled incorrectly. If everything works as planned and you do feel slight tension it is time to thread the needle and run a second test seam. You should notice much smaller loops under the fabric on the bottom side of the seam. As you adjust and test you will notice the seam starts to balance the tension between the top of the seam and the bottom of the seam and the loops will go away. Now for those of you who do not have the typical disk type upper tension assembly. For instance, if your machine has a flat spring tensioner mounted on the top of the arm, or if it has a clutch type set-up where the thread wraps around a tiny pulley mounted between friction pads that act as brakes as the tension is tightened, the theory is still the same. If the loops are under the fabric or on the bottom side of the seam then the problem is the upper tension. 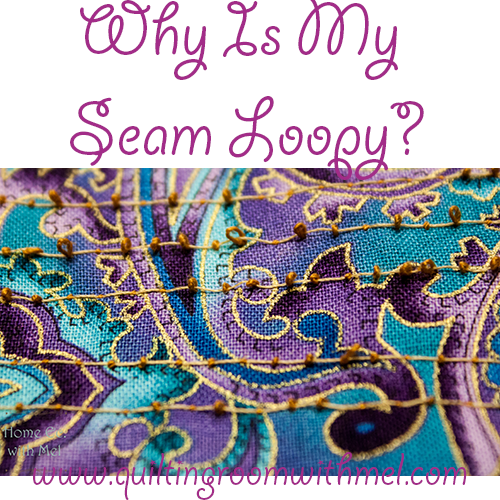 If the loops are on top of the fabric then it is the bobbin tension that must be addressed. 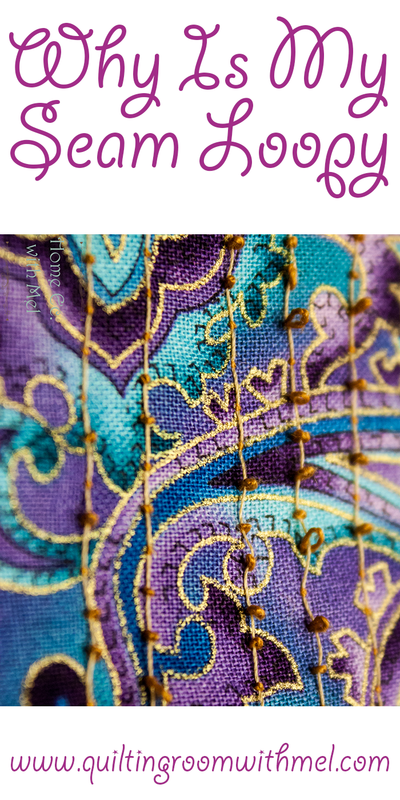 I think the next post will cover the various bobbins assemblies and how we address the issues of tension so we can balance the seam and make beautiful stitches. Until then may your hearts be light and your seams be straight. Have fun.